Both as regards the geomorphological structure and its size, this it Menorca‘s most important nature park. If your passion is bird-watching, you will find lots of water birds here, especially ducks, herons, cormorants and raptors such as ospreys, kites and booted eagles. 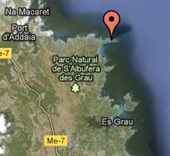 To get there, turn off the Mahón - Fornells road towards Es Grau at about 1 kilometre from Mahón. Before you get to Es Grau, you will see the S‘Albufera Parc Natural turning on your left (It is the same turning as for Shangri-La). Keep on the main track until the end, where there is a small parking lot and an information sign. Two of them start out at the parking area with views over the wetlands. A third one begins in the village of Es Grau. The first two prepared routes provide a number of hides and observation points to make use of. The hides allow you to see the different species quite close and information boards explain which birds you might see. The third route runs a short distance from the beach through trees. You will more or less need an hour for the whole walk around the lagoon (2 kilometres). Another good bird-watching area is an area right behind the lagoon known as Es Prat de Morella. In S'Albufera des Grau there is one of the four Menorcan wineries, Vinya Sa Cúdia.